Drive past any large hardware supply store in the spring and you will see neat rows of charcoal and gas grills standing in close formation. The choices are amazing and so are some of the prices. High-end gas grills can be priced around $2,500 and feature options such as stainless steel, six burners, side burners, rotisseries, smoker boxes, sear stations and infrared heat. While I can appreciate the complex engineering of such grills, I often wonder what food is actually being prepared in these over-the-top cookers that would warrant spending that much money. As the one who has always performed the grilling chore in my home, I have come to the conclusion that less is more! All I want my grill to do is heat up quickly, cook evenly and be economical to operate. If it cleans up easily...that is also a plus. My new gas grill cost less than $200 and has side shelves that fold down. Since space is limited at our condo, this slender grill fit right in with our lifestyle. 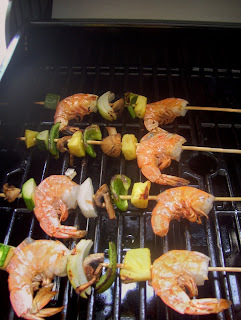 My new grill is well built and I love any mealtime reason to use it...such as today's lovely shrimp kabobs. The shrimp are giant-sized and were cooked to perfection...in the shell. 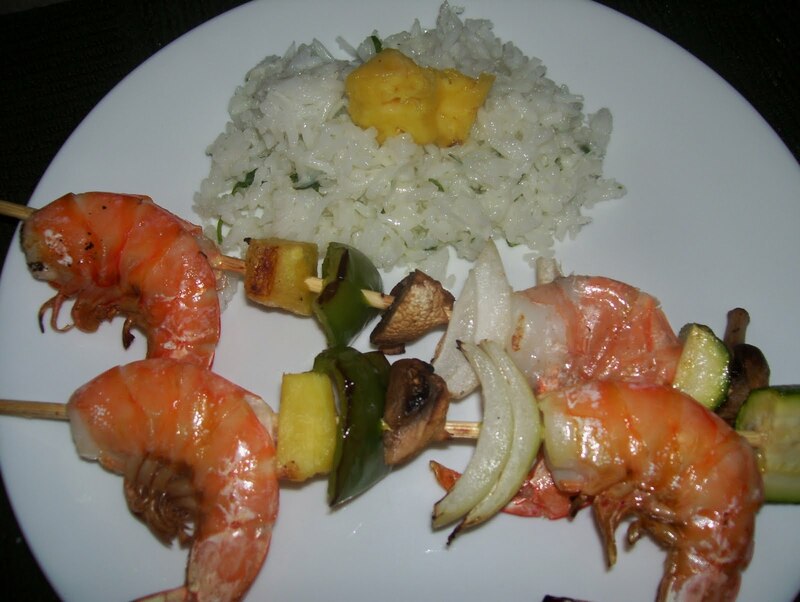 (Smaller shrimp often become tough and dry when grilled). How to grill perfect shrimp: with scissors...first cut a slit in the shell from the head end to within one-half inch of the tail. Remove sand vein; leave on shell. Slide a pre-soaked wooden skewer through the shrimp lengthwise. Add other vegetables and fruit if desired. Heat grill to 350 degrees. 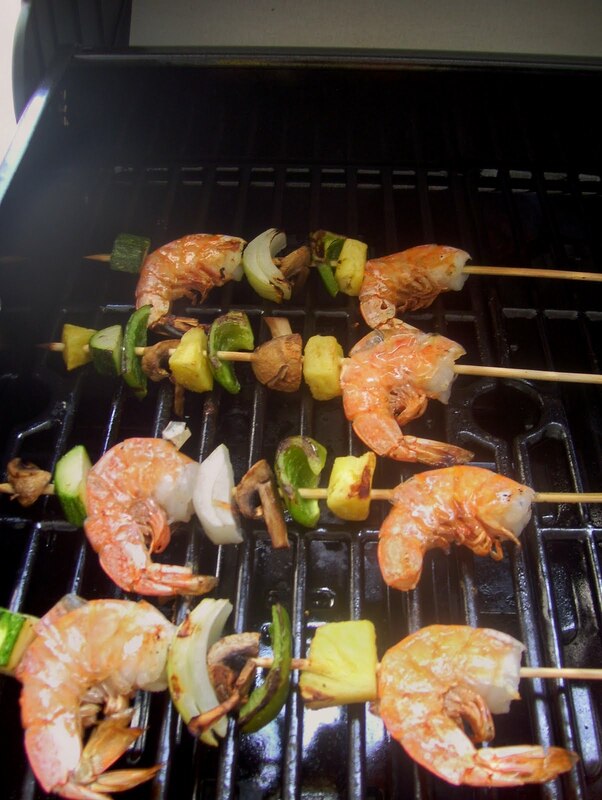 Spray one side of shrimp and vegetables with cooking spray and place, greased-side-down on heated grill. Close lid and cook for 2 minutes. Lift lid. Spray top side of food with cooking spray and turn over; close lid. Cook for 2 minutes. If shrimp are very large, they may need to be cooked for 2 more minutes (turn shrimp for this added time). Otherwise, removed skeweres to a plate and serve with lemon wedges. Place 1 C of hot, cooked rice in a bowl, add 1-2 T coconut cream, 1 T coconut, and 1 T cilantro. Mix well, garnish with pineapple pieces if desired and serve. Recipe may be increased.